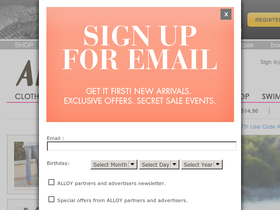 Shop Alloy, online at store.alloy.com, for the trendiest fashions for juniors, teens, and women. Alloy offers young and hip styles in dresses, jeans, tops, blouses, trousers, sweaters, casual dresses, date night dresses, outerwear, coats, faux furs, shoes, boots, flats, heels, wedges, cardigans, purses, jewelry, scarves, and more. In addition to the hippest styles, Alloy also offers discounts and clearance items. But before you shop, be sure to get all the latest shop.alloy.com discounts, Alloy promotions, and Alloy coupon codes found here at RetailSteal.com. Alloy ships within the United States and internationally. See site for shipping options and rates. Shop Alloy.com and save 15% on orders up to $99.99, 20% on orders from $100-$149.99, and 30% on orders of $150+ with this code today. Save 20% on any order from Alloy. Click here to shop and use coupon code to save. Enjoy $20 savings and Free Shipping when you spend $99 or more when you shop at Alloy today. Use this coupon code to start saving. Save $20 and enjoy free shipping at Alloy. Use coupon code with purchases $99+. Save 80% in the clearance at Alloy. Shop now for great savings on the hottest fashions. Save up to 80% on women's apparel on clearance at Alloy. Click here to save on dresses, sweaters, blouses, and more. Shop dresses, starting from only $10 on clearance from Alloy. Click link to shop.